Current and former students describe how they came to choose Miami and environmental co-majors, their study abroad and research experiences, extracurricular activities, and more. "Environmental science is incredibly interdisciplinary. You are not just studying one thing all day every day. There's chemistry, biology, geology, and a lot more because all these elements interact and, in turn, they influence what happens in the world on multiple levels." "Beyond the classroom, for over 3 years I've been the president of EcoReps, which makes up part of the community leadership team in every residence hall. We go into various residence halls to conduct what we call 'trash audits,' where we weigh the trash collected in the receiving area and pick through it all to find things that could have been recycled." "I am super passionate about my undergraduate research. A lot of people think that the only reason to do it is to go for your doctorate, but I feel like research has given me a lot of professional experiences, challenging me to formulate and manage my own projects. This is applicable to so many things beyond a research career, and I definitely would recommend it. 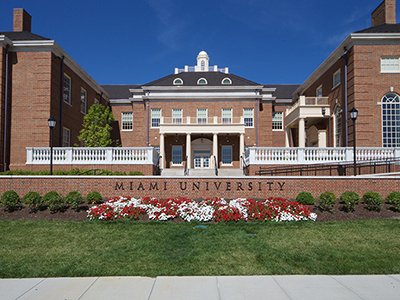 Miami offers research opportunities in a variety of fields so that everyone can find something that interests them." Read what Gina had to say about the liberal arts and her undergraduate research. "I've had a number of great professors who have encouraged me to continue to pursue my passion in zoology and conservation…Dr. Sarah Dumyahn in the Institute for the Environment and Sustainability mentored me through my big internship research project I did at the Brookfield Zoo in summer 2015 and showed an interest in my experience at the zoo as well as my future ambitions." Read what Claire had to say about her internships and involvement in Miami University's Conservation Team. "I hope to go into the emerging sustainable business field, be it renewable energy or energy efficiency, so the co-major makes complete sense. The co-major has also greatly strengthened my appreciation for the natural world and will help ensure that I receive a job after I graduate." Read what Ian had to say about his involvement in Green Oxford and other environmental organizations. "I've always wanted to become a marine biologist but my co-major and the courses I've taken in geology broadened my perspective. My plans now include graduate school to study marine biology or environmental science policy and management." Read what John had to say about his undergraduate research and extracurricular activities. "Like so many incoming students, I was eager to create my own educational path. At Miami, it was easy to find support from professors as I merged two fields of study. Plus I found plenty of extra-curricular activities to keep me busy." Read what Apriil had to say about choosing her major and co-major, and tropical ecosystems course. "At Miami, I'm involved in a brand new chapter of Net Impact, … it focuses on social as well as environmental responsibility … This chapter was just recently founded at Miami and everyone has really high hopes to make Miami and Oxford greener through our work!" Read what Erin had to say about her study abroad in New Zealand. "I'm involved in Miami's student environmental group, Green Oxford. We do a number of projects throughout the year to promote sustainability in the Miami and Oxford communities. I've personally been involved in organizing our annual Earth Day 5K for the past two years." Read what Anne had to say about making connections among diverse courses and her study abroad in Denmark. "I focused [my research] on the history of environmental literature, and looked at how the writing of authors like Emerson and Thoreau, who are generally classified within the realm of literature, had an effect on the American environmental movement." Read what Kate had to say about finding her major and her extracurricular activities. "I've found that the [Environmental Science] co-major has allowed me to diversify my learning and gain a more global perspective on how other people view the environment … after taking the courses required for the co-major, I've become more passionate about how successful conservation efforts can be established." Read what Jeena had to say about her research and other activities while at Miami.